A new version of drat just arrived on CRAN as another no-human-can-delay-this automatic upgrade directly from the CRAN prechecks (though I did need a manual reminder from Uwe to remove a now stale drat repo URL -- bad @hrbrmstr -- from the README in a first attempt). This release is mostly the work of Neal Fultz who kindly sent me two squeaky-clean pull requests addressing two open issue tickets. As drat is reasonably small and simple, that was enough to motivate a quick release. I also ensured that PACKAGES.rds will always if committed along (if we're in commit mode), which is a follow-up to an initial change from 0.1.3 in September. Binaries for macOS are now split by R version into two different directories (Neal Futz in #67 addring #64). The target branch can now be set via a global option (Neal Futz in #68 addressing #61). In commit mode, add file PACKAGES.rds unconditionally. CRAN requested a release updating any URLs for Omegahat to the (actually working) omegahat.net URL. So that caused this 0.1.2 release which arrived on CRAN yesterday. It contains the requested change along with one or two other mostly minor changes which accumulated since the last release. drat stands for drat R Archive Template, and helps with easy-to-create and easy-to-use repositories for R packages. Since its inception in early 2015 it has found reasonably widespread adoption among R users because repositories is what we use. In other words, friends don't let friends use install_github(). Just kidding. Maybe. Or not. One year ago (tomorrow) drat 0.1.0 was released. It held up rather well, but a number of small fixes and enhancements piled up, along with somewhat-finished to still-raw additions to the examples/ sections. With that, we are happy to announce drat release 0.1.1 which arrived on CRAN earlier today. This version 0.1.1 builds on the previous release from one year ago. Several users sent in nicely focused pull request, and I added a bit of spit and polish here and there. A new version 0.1.0 of the drat package arrived on CRAN today. Its name stands for drat R Archive Template, and it helps with easy-to-create and easy-to-use repositories for R packages, and is finding increasing by other projects. This version 0.1.0 builds on the previous releases and now adds complete support for binaries for both Windows and OS X. This builds on what had been added in the previous release 0.0.4. Also of note: The rOpenSci project now uses drat to distribute their code, and Carl Boettiger has written a nice blog post about it. A new version, now at 0.0.4, of the drat package arrived on CRAN yesterday. Its name stands for drat R Archive Template, and it helps with easy-to-create and easy-to-use repositories for R packages, and is finding increasing by other projects. 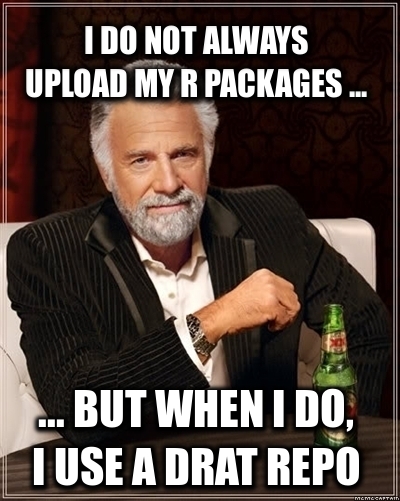 R relies on package repositories for initial installation of a package via install.packages(). A crucial second step is update.packages(): For all currently installed packages, a list of available updates is constructed or offered for either one-by-one or bulk updates. This keeps the local packages in sync with upstream, and provides for a very convenient way to obtain new features, bug fixes and other improvements. So by installing from a repository, we automatically have the ability to track the repository for updates. Fairly recently, the drat package was added to the R ecosystem. It makes both aspects of package distribution easy: providing a package (if you are an author) as well as installing it (if you are a user). Now, because drat is at the same time source code (as it is also a package providing the functionality), and a repository (using what drat provides ib features), the "namespace" becomes a little cluttered. But because a key feature of drat is the "one variable" unique identification via the GitHub, I opted to create a drat repository in the name of a new organisation: ghrr. This is a simple acronym for GitHub Hosted R Repository. RcppArmadillo where I announced both a release candidate before Armadillo 5.000 came out, as well as the actual RcppArmadillo 0.500.0.0 which is not (yet) on the mainline repository as two affected packages need a small update first. Users, however, can get RcppArmadillo already from the sibling Rcpp drat repo. RcppToml is a new package I am currently working on implementing a toml parser based on cpptoml. It works, but it not quite ready for public announcements yet, and hence perfect for ghrr. ghrr is meant to be open. While anybody can open a drat repository, particularly on GitHub, it may be beneficial to somehow group packages. This is however not something that can be planned ex-ante: it may just happen if others who see similar benefits in this can in fact contribute. In that spirit, I strongly encourage pull requests. Early on, I made my commit messages conform to a pattern of package version sha1 repourl to make code provenance of every commit very clear. Ideally, subsequent commits would conform to such a scheme, or replace it with a better one. Comments and questions via email or issue tickets are more than welcome. We hope that others find ghrr to be a useful tool for easy repository management and use via GitHub. Several weeks ago we introduced the drat package. Its name stands for drat R Archive Template, and it helps with easy-to-create and easy-to-use repositories for R packages. Two early blog posts describe drat: First Steps Towards Lightweight Repositories, and Publishing a Package, and since the previous release, a a guest post on drat was also added to the blog. Several people have started to use drat to publish their packages, and this is a very encouraging sign. I also created a new repository and may have more to say about this in another post once I get time to write something up. four new vignettes got added, including two guests posts by Steven and Colin as well as two focusing, respectively, on drat for authors and and drat for users. The work on the vignettes is clearly in progress as Colin's guest post isn't really finished yet, and I am not too impressed with how the markdown is rendered at CRAN so some may still become pdf files instead. Editorial Note: The following post was kindly contributed by Steven Pav. all the drat stores you have added will be checked for package updates, along with their dependencies which may well come from other repositories including CRAN. Micro releases. For package authors, this provides a means to get feedback from the early adopters, but also allows one to push small changes and bug fixes without burning through your CRAN karma (if you have any left). My personal drat store tends to be a few minor releases ahead of my CRAN releases. Local repositories. In my professional life, I write and maintain proprietary packages. Pushing package updates used to involve saving the package .tar.gz to a NAS, then calling something like R CMD INSTALL package_name_0.3.1.9001.tar.gz. This is not something I wanted to ask of my colleagues. With drat, they can instead add the following stanza to .Rprofile: drat:::addRepo('localRepo','file:///mnt/NAS/r/local/drat'), and then rely on update.packages to do the rest. Rolling your own vanilla CRAN mirror, though I suspect there are better existing ways to accomplish this. Patching CRAN. Suppose you found a bug in a package on CRAN (inconceivable!). As it stands now, you email the maintainer, and wait for a fix. Maybe the patch is trivial, but suppose it is never delivered. Now, you can simply make the patch yourself, pick a higher revision number, and stash it in your drat store. The only downside is that eventually the package maintainer might bump their revision number without pushing a fix, and you are stuck in an arms race of version numbers. Forgoing CRAN altogether. While some package maintainers might find this attractive, I think I would prefer a single huge repository, warts and all, to a landscape of a million microrepos. Perhaps some enterprising group will set up a CRAN-like drat store on github, and accept packages by pull request (whether github CDN can or will support the traffic that CRAN does is another matter), but this seems a bit too futuristic for me now. I shudder at the thought of hundreds of tiny drat stores. Perhaps there should be a way to aggregate addRepo commands in some way. This would allow curators to publish their suggested lists of repos. Drat stores are served in the gh-pages branch of a github repo. I wish there were some way to keep the index.html file in that directory reflect the packages present in the sources. Maybe this could be achieved with some canonical RMarkdown code that most people use. Update:Two typos fixed in code examples on 2015-Mar-27. The drat package was released earlier this month, and described in a first blog post. I received some helpful feedback about what works and what doesn't. For example, Jenny Bryan pointed out that I was not making a clear enough distinction between the role of using drat to publish code, and using drat to receive/install code. Very fair point, and somewhat tricky as R aims to blur the line between being a user and developer of statistical analyses, and hence packages. Many of us are both. Both the main point is well taken, and this note aims to clarify this issue a little by focusing on the former. Another point make by Jenny concerns the double use of repository. And indeed, I conflated repository (in the sense of a GitHub code repository) with repository for a package store used by a package manager. The former, a GitHub repository, is something we use to implement a personal drat with: A GitHub repository happens to be uniquely identifiable just by its account name, and given an (optional) gh-pages branch also offers a stable and performant webserver we use to deliver packages for R. A (personal) code repository on the other hand is something we implement somewhere---possibly via drat which supports local directories, possibly on a network share, as well as anywhere web-accessible, e.g. via a GitHub repository. It is a little confusing, but I will aim to make the distinction clearer. So let us for the remainder of this post assume the role of a code publisher. Assume you have a package you would like to make available, which may not be on CRAN and for which you would like to make installation by others easier via drat. The example below will use an interim version of drat which I pushed out yesterday (after fixing a bug noticed when pushing the very new RcppAPT package). For the following, all we assume (apart from having a package to publish) is that you have a drat directory setup within your git / GitHub repository. This is not an onerous restriction. First off, you don't have to use git or GitHub to publish via drat: local file stores and other web servers work just as well (and are documented). GitHub simply makes it easiest. Second, bootstrapping one is trivial: just fork my drat GitHub repository and then create a local clone of the fork. There is one additional requirement: you need a gh-pages branch. Using the fork-and-clone approach ensures this. Otherwise, if you know your way around git you already know how to create a gh-pages branch. Your branch is up-to-date with 'origin/gh-pages'. Now, let us assume you have a package to publish. In my case this was version 0.0.1.2 of drat itself as it contains a fix for the very command I am showing here. So if you want to run this, ensure you have this version of drat as the CRAN version is currently behind at release 0.0.1 (though I plan to correct that in the next few days). To publish an R package into a code repository created via drat running on a drat GitHub repository, just run insertPackage(packagefile) which we show here with the optional commit=TRUE. The path to the package can be absolute are relative; the easists is often to go up one directory from the sources to where R CMD build ... has created the package file. Writing objects: 100% (7/7), 7.37 KiB | 0 bytes/s, done. You can equally well run this as insertPackage("drat_0.0.1.2.tar.gz"), then inspect the repo and only then run the git commands add, commit and push. Also note that future versions of drat will most likely support git operations directly by relying on the very promising git2r package. But this just affect package internals, the user-facing call of e.g. insertPackage("drat_0.0.1.2.tar.gz", commit=TRUE) will remain unchanged. And in a nutshell that really is all there is to it. With the newly drat-ed package pushed to your GitHub repository with a single function call), it is available via the automatically-provided gh-pages webserver access to anyone in the world. All they need to do is to point R's package management code (which is built into R itself and used for e.g._ CRAN and BioConductor R package repositories) to the new repo---and that is also just a single drat command. We showed this in the first blog post and may expand on it again in a follow-up. So in summary, that really is all there is to it. After a one-time setup / ensuring you are on the gh-pages branch, all it takes is a single function call from the drat package to publish your package to your drat GitHub repository. Now that drat is on CRAN and I got a bit of feedback (or typo corrections) in three issue tickets, I thought I could show how to quickly post such an interim version in a drat repository. Now, I obviously already have a checkout of drat. If you, dear reader, wanted to play along and create your own drat repository, one rather simple way would be to simply clone my repo as this gets you the desired gh-pages branch with the required src/contrib/ directories. Otherwise just do it by hand. Because I want to use the drat repo next, I need to now switch from master to gh-pages; a step I am omitting as we can assume that your drat repo will already be on its gh-pages branch. All is left to is to add, commit and push---either as I usually via the spectacularly useful editor mode, or on the command-line, or by simply adding commit=TRUE in the call to insert() or insertPackage(). and presto, a new version of a package we have installed (here the very drat interim release we just pushed above) is updated. A new package of mine just got to CRAN in its very first version 0.0.1: drat. Its name stands for drat R Archive Template, and an introduction is provided at the drat page, the GitHub repository, and below. drat builds on a core strength of R: the ability to query multiple repositories. Just how one could always query, say, CRAN, BioConductor and OmegaHat---one can now adds drats of one or more other developers with ease. drat also builds on a core strength of GitHub. Every user automagically has a corresponding github.io address, and by appending drat we are getting a standardized URL. to register my drat. Now install.packages() will work using this new drat, as will update.packages(). The fact that the update mechanism works is a key strength: not only can you get a package, but you can gets its updates once its author replaces them into his drat. show here with the alternate use case of a local fileshare you can copy into and query from---something we do at work where we share packages only locally. The easiest way to obtain the corresponding file system layout may be to just fork the drat repository. So that is it. Two exported functions, and two unexported (potentially name-clobbering) shorthands. Now drat away! Courtesy of CRANberries, there is also a copy of the DESCRIPTION file for this initial release. More detailed information is on the drat page.